How many of us want a multi-million dollar business? How about when you were 15? It's easy to think about all of the advantages that having that kind of early success would afford. It is more difficult to anticipate and understand the challenges and adversity you would face. Would you be able to overcome it? This is exactly what my guest today, Mark Metry, was faced with. His online business exploded into a 7-figure behemoth. But behind that success Mark was burdened by depression and the mental and physical effects it was unleashing on him. Today Mark runs a successful marketing company and hosts the highly successful podcast Humans 2.0. 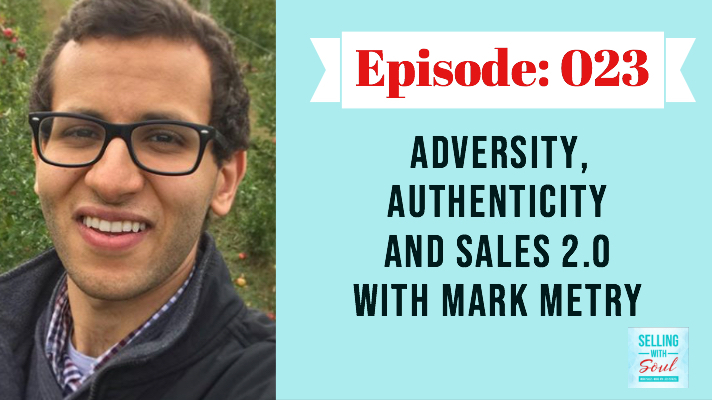 Mark focuses on mindset, mental health and how we can be better versions of ourselves. He does this through expert interviews with today's modern thought leaders like Seth Godin, Gretchen Rubin, and Naveen Jain among others. Follow Mark on Instagram and engage with him today! We're going to discuss how Mark was able to face down his problems and change his identity from Mark 1.0 to Mark 2.0. Are you an entrepreneur, small business owner or leader looking for more advanced, one-on-one help generating revenue? Click for more information about my Revenue Accelerator Sessions and let’s exceed your next revenue goal. 16:34 - Selling a particular "future dream"
Is there a particular topic, challenge or expert view that you would like to see featured here on theSelling With Soul podcast? Email me at Meredith@MeredithMessenger.com and be part of our show!